It was just last month I finally realized I’ve been misspelling “Bloomday” all this time. The rest of the garden blogging world calls it Bloom Day. My error is not due a love of James Joyce but rather the fact that I am from Spokane, Washington. Every spring since I was a child the Sunday before Mother’s Day has meant one thing, the Bloomsday run, a 12K run (and walk, for those of us that do not run) through downtown Spokane and beyond. If you only knew how many times I’ve typed Bloomsday, instead of Bloomday, sometimes only catching my error after I hit “publish.” So since I was being hypersensitive to not making that mistake I was completely oblivious to the one I was making. However with 42 posts behind me I can’t change now…so Bloomday it is, here at danger garden. I spotted this beauty on the table of plants for sale when I went to hear Kelly and Sue of Far Reaches Farm give a talk at Joy Creek Nursery last month. I think I surprised Scott and Linda with the speed at which I zoomed over and grabbed it before anyone else had a chance. Plant lust took over and look out friends! Of course my lust had been fueled by Denise over at A Growing Obsession who recently purchased one for herself. As if the flowers aren't enough look at those crazy Martian eye seed pods! 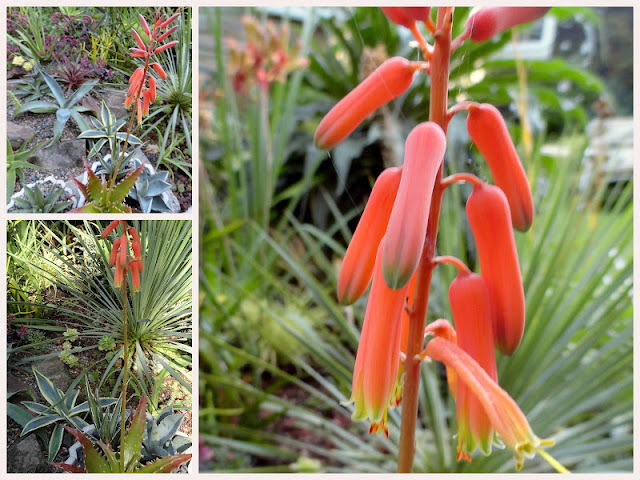 The only Hesperaloe to have bloomed this year (of five in my garden) keeps on going, making both me and the hummingbirds happy! 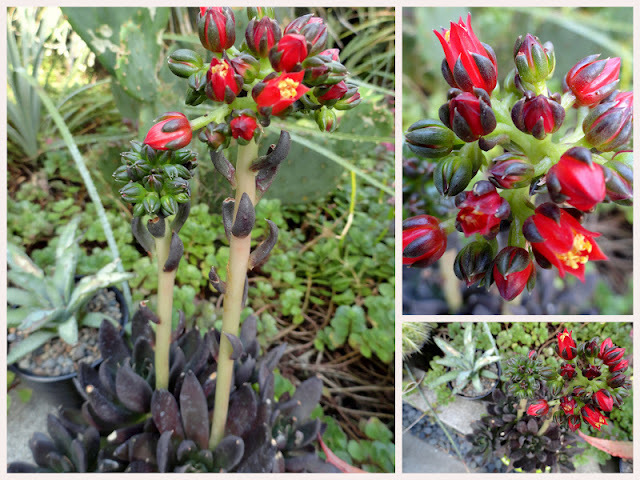 In the drama department we have Echeveria ‘Black Prince'...black foliage, orange/red flowers...pretty cool! 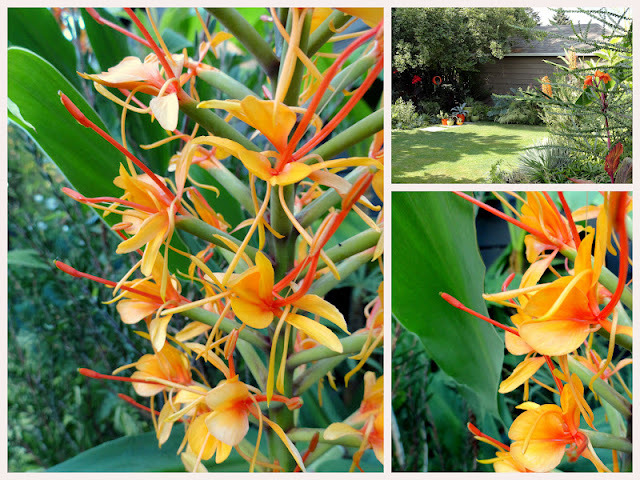 Hedychium Tara...I want about 10 more of these! 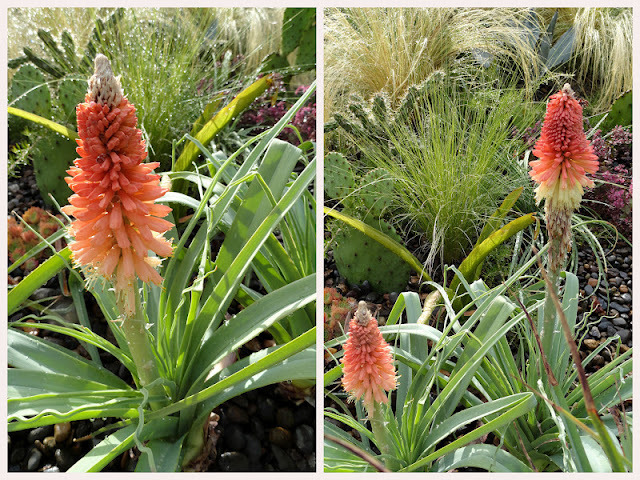 Kniphofia caulescens...as if these weren't already making me very happy there are 4 more blooms on the way, yay! 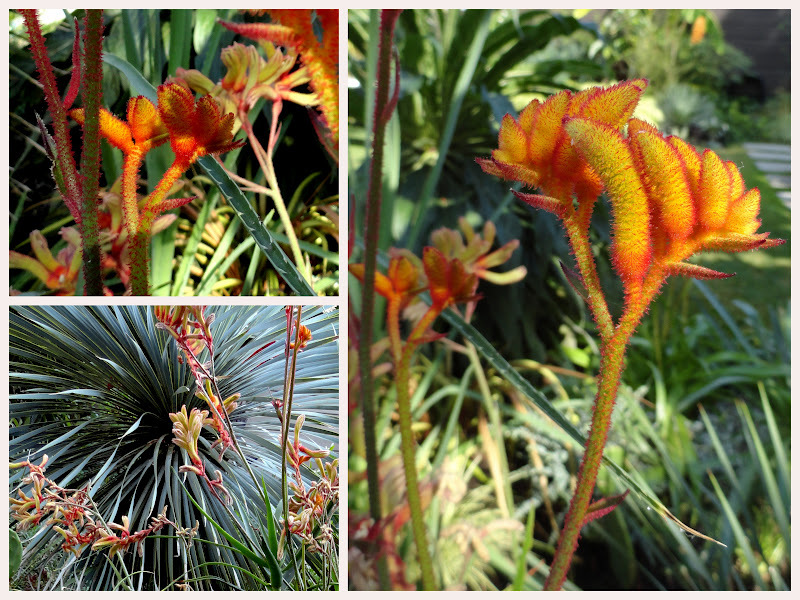 Finally the energizer bunny of the summer garden, Kangaroo Paw (Anigozanthos)...love it! We're back in Az (Tucson) now and I just bought a 4" potted Black Prince Echeveria - hope it blooms as beautifully some day! With the sun and heat you can provide it there just add water and I bet it's instant blooms! Wow! Cool flower power man. Love the Alstroemera isabellana and was thinking of getting one next time I go to Far Reaches. 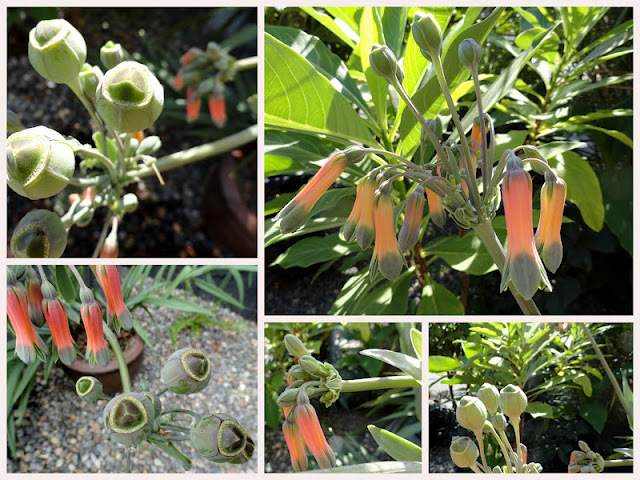 Now that you've shown the seed pods, it's a definite yes! I think I saw that Hedychium at the NHS plant sale yesterday. Is it really really tall? Someone was hauling two of them around the sale in a little red wagon. The Alstroemeria is wonderfully funky. There's no sign of my Kniphofias blooming this year, I planted them this spring, so maybe next year. Lots of reds and oranges in your garden, so appropriate this time of year. It is pretty tall, maybe a little over 5ft? Mine arch out at an angle though so if they were straight they'd be even taller. These Knip's haven't bloomed every year, this seems to be a banner year for them. Oddly one of the flower spikes dried up as it was about to open, it's the strangest looking thing. 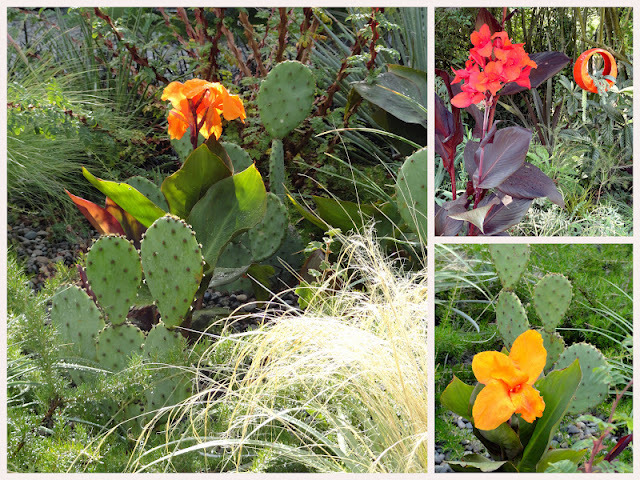 Like a tropical color splash you have today, among the spiky side of life. The cannas, hesperaloes, Echeveria ‘Black Prince', and Hedychium Tara grab me the most. Eclectic, yet still such a nice mix, Ms. Danger. And thank you Mr DD! Oooo la la!!!! Such different and intersting flower offerings. Love them all. I'm jealous of your blooming Hedychium... I've had one for several years but just can't get it to bloom. That Alstromeria is a winner as well. I think it's all about the placement. I've had another in the ground for several years that hasn't done a thing. These get more sun and water. What a gorgeous bloomday. How do you get those plans to bloom with such perfection? You have the magic touch. And you are very kind, you should see what I didn't photograph! I don't know of a common name for that plant...but it's worth hunting down for sure. So very cool! Love all those exotic blooms you have. Happy Bloomsday from a person that has to teach Spelling but that also has to look up words all the time. Ugh! It's my Achille's heel...and I can't even spell Achilles! Love the Bloomday you have each and every month. Don't change a thing. Spell check is kind of a double edges sword isn't it? On one had I rely on it too much, on the other it has taught me a few things. I envy those with good spelling and grammar. Perhaps the worst book I have ever read was South of Broad by Pat Conroy, and it has numerous references to Bloomsday. He should have been made to answer for his crime, maybe because I wanted it to be so good. Your GBBD offerings are very exotic. What a dubious honor, to be placed among the worst books one has read. Stunning! I LOVE all the orange! It is certainly the BEST bloom day colour! You are right about the ginger. You need 10 more. I'm not even exaggerating... its that spectacular! If you can believe it, I don't have any gingers. yikes! the tropical loving me! ahhh! What have you been thinking!? You need to get a couple of gingers Louis! Love your blooms this month Loree, and thanks for explaining the 'Bloomsday' thing in Spokane..I just flew back home from there this morning and saw a poster yesterday in the hotel ..was I missing a garden tour ? Glad I was not. You do have some very cool stuff going on in the Danger Garden this month ! I'm kind of jealous that you've been to Spokane...I haven't since June! Very nice end of the summer almost fall.... colors. Everything looks so lush as usual. With our dry days there are a few areas not looking so lush, trust me. Thankfully we had a pretty mosquito free summer here, it was such a wet spring I was afraid it was going to be a bad year. You are wonderfully orange this month. Love the Kniphofia caulescens. Mine has yet to bloom, so now I'm twice as impatient - maybe next year? That Echeveria 'Black Prince' is stunning! 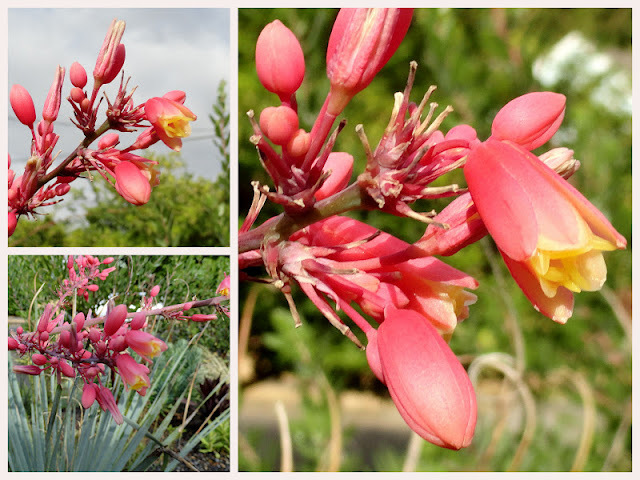 Really like the pairing of the Kangaroo Paw with the Yucca...superb! 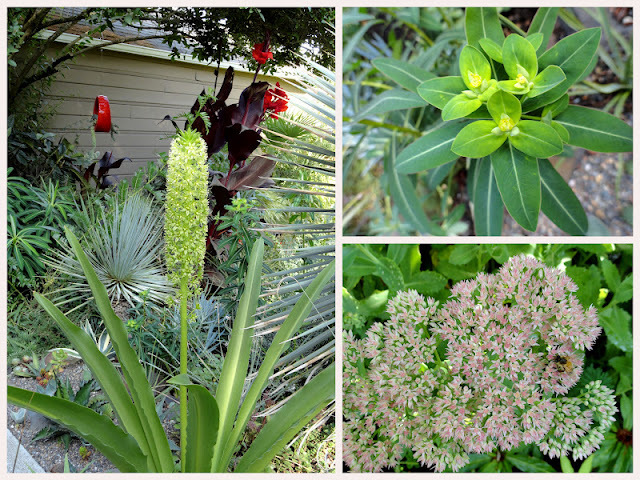 I've been looking into hedychiums too. 'Tara' will be kept in mind. So glad you grabbed that alstro -- can you imagine a half dozen of those bloom stalks? I've tried that kniph caulescens a couple times and never saw bloom. Yours is gorgeous. Orange rules! I hope the Alstroemera comes back as strong next year. I put mine in a container, will that help, or hurt? I'm mad for Kniphs...that one is stunning. Never have had an Echeveria bloom, but now I;m pulling for my 'Black Prince' to someday come. Such pretty blooms Loree! Looks like the garden is at its peak too :) Kangaroo Paw blooms looks so exotic especially! Alstroemera isabellana is stunning--as are all of your blooms! Black prince is very cool--love it! I just found your site and had to literally LOL in your description of the name of your site. How true--plant obsessions are seriously dangerous for our financial health! ;-) Look forward to visiting your garden again soon--it's just beautiful.